Plastic. 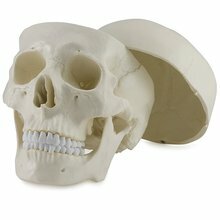 A detailed reproduction of a life-size human skull with all structural details. The skullcap is removable to show the internal structure of the skull. The mandible is articulated and removable. All the joints, sutures, fissure, foramina, and processes are portrayed with utmost accuracy. Plastic. 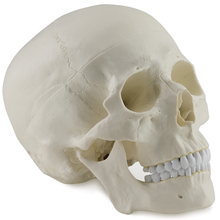 A detailed reproduction of a life-size human skull with all structural details. The skullcap is removable to show the internal structure of the skull. The mandible is articulated and removable. All the joints, sutures, fissure, foramina, and processes are portrayed with utmost accuracy. Unmounted.